There is a shift in focus from molecular drugs to protein based drugs in pharmaceutical industry. Protein drugs are artificially synthesized protein used in treatment of chronic diseases such as cancer, diabetes and CVD. Globally, development the arena of proteomics and nanotechnology, rising incidences of chronic and autoimmune diseases, rise in the awareness among people regarding protein drugs, increasing focus on research and development process, development in drug delivery system, and advantages of protein based drugs such as, high specificity, enhanced efficacy, affinity, solubility, and low incidences of toxicity are the prime growth drivers of protein drugs market. 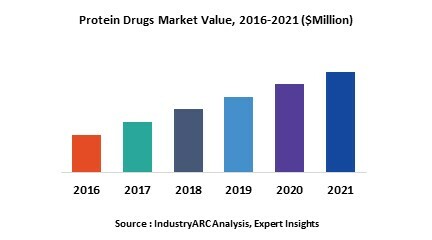 In addition, increase in adoption of protein drugs in emerging economies such as China, India and others, will create new opportunities for global protein drugs market. However, higher cost of the research and development, and complex government approval processes are the key restraints for protein drugs market.